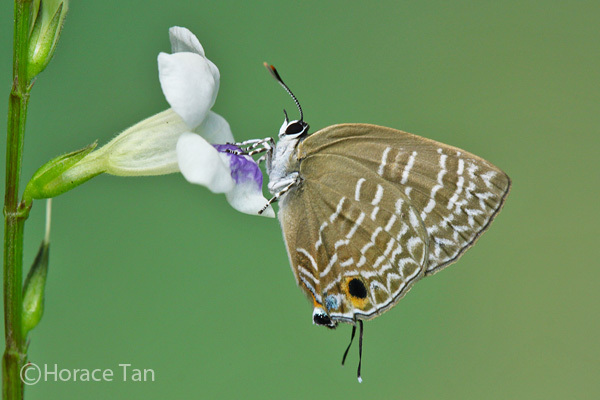 This 2nd instalment of our Butterflies' Larval Host Plants series features the Chinese Violet (Asystasia gangetica subspecies micrantha), a member of the family Acanthaceae, which is a family of dicotyledonous flowering plants occurring as tropical herbs, shrubs or twining vines. 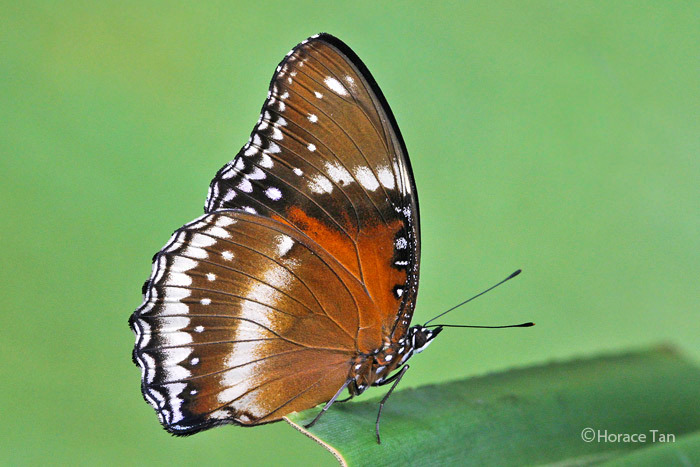 A. gangetica micrantha is native to sub-Saharan Africa. 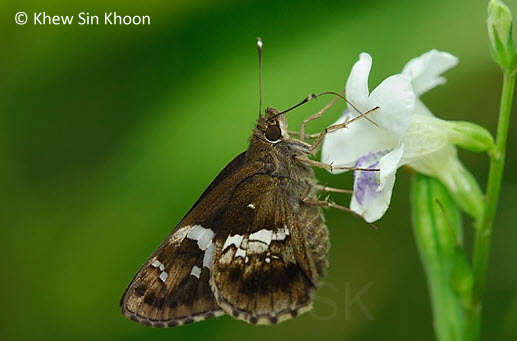 It has spread to and become naturalized in other tropical regions including Singapore where its occurrence is widespread as a weed in multiple habitats including wastelands, roadside, forest fringes, coastal areas and other neglected land parcels. 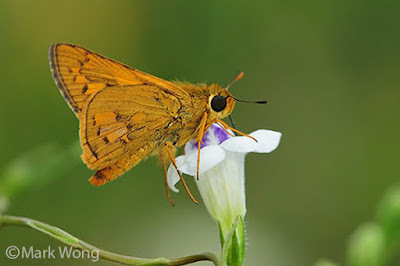 Larval Host for Butterfly Species: Hypolimnas bolina jacintha (Jacintha Eggfly), Doleschallia bisaltide ?bisaltide var. 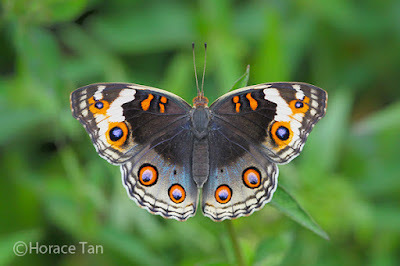 (Autumn Leaf), Junonia orithya wallacei (Blue Pansy). A small patch of the Chinese Violet on the side of a pathway at Mount Faber. 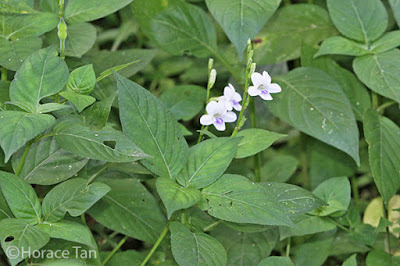 An ascending and spreading herb, the Chinese Violet is a fast growing plant that could reach up to a height of 60cm, and to about 100cm if supported. 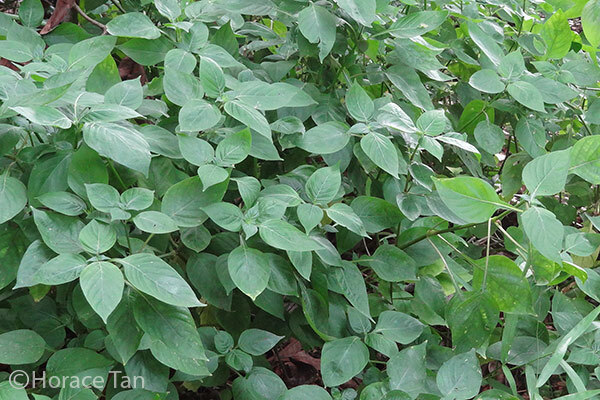 The stems root easily when the nodes come into contact with moist soil. A young plant of the Chinese Violet establishing itself at a patch of soil (disturbed by foraging wild boars) at a reservoir park, showing the branching of stems. The leaves are simple, opposite and decussate (successive pairs of opposite leaves occur at right angle to each other). Each leaf is ovate or heat-shaped, 3 to 7.5cm long. 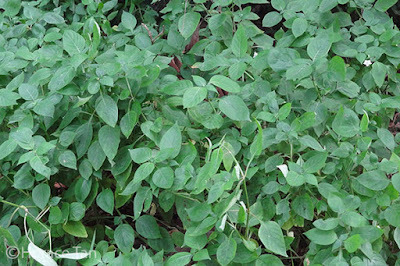 In parts of Africa, the leaves are used as a vegetable and as a herbal medicine. 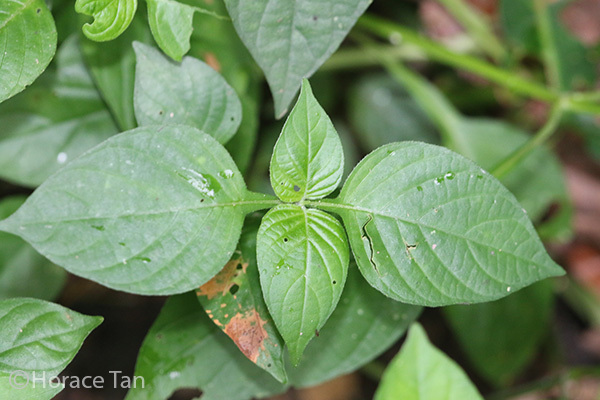 A top view of two successive pairs of leaves, showing the opposite and decussate arrangement. 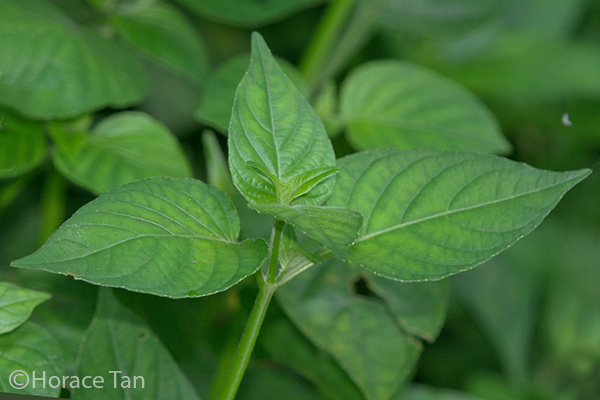 A side view of two successive pairs of leaves, showing the opposite and decussate arrangement. 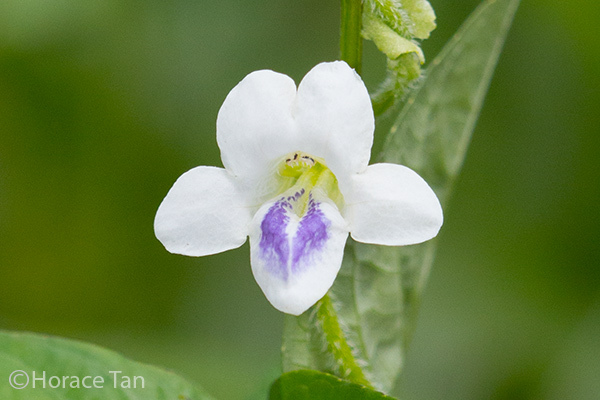 Flowers of the Chinese Violet are small and tubular, each up to 3.5cm long. 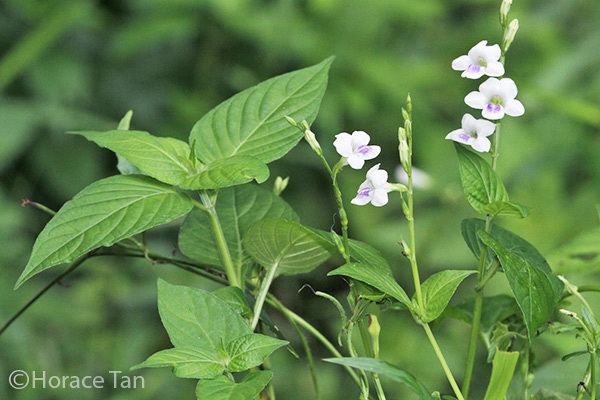 There are usually 6 to 10 flowers borne on one side of a spike-like inflorescence. The calyx (sepals) is deeply 5-lobed, and the five spreading petals are mostly white with the bottom petal bearing purple blotches. 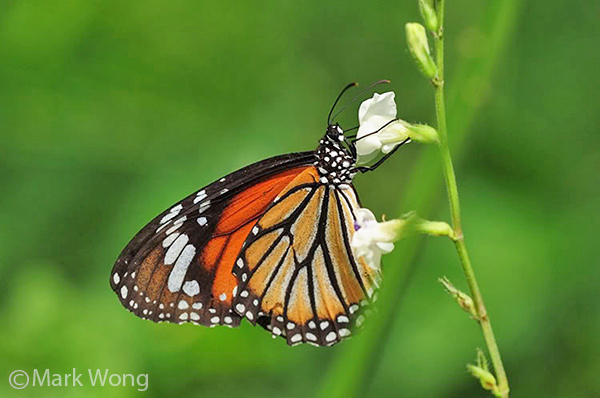 These bisexual flowers attract insects including various species of butterflies to act as pollinators in the reproduction process. 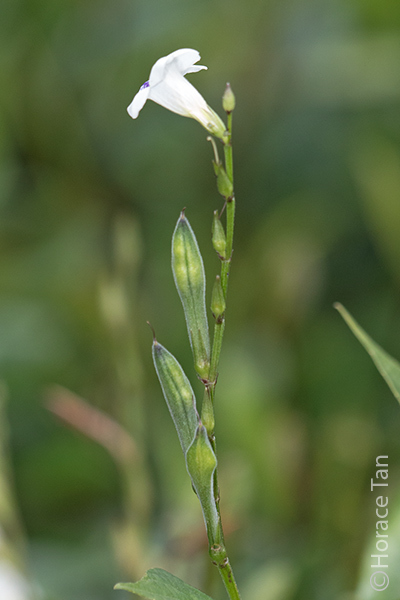 An inflorescence with two flowers near bottom and flower buds further up. Close up view of a flower of the Chinese Violet. 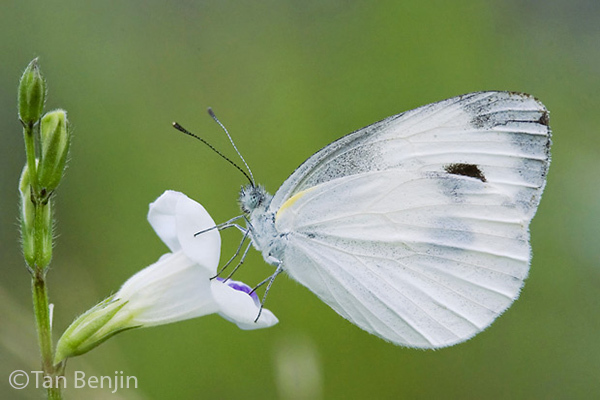 Butterflies taking nectar from the flower of the Chinese Violet. Top left: Chestnut Bob, Top right: Cabbage White; Bottom left: Common Dartlet; Bottom Right: Common Tiger. 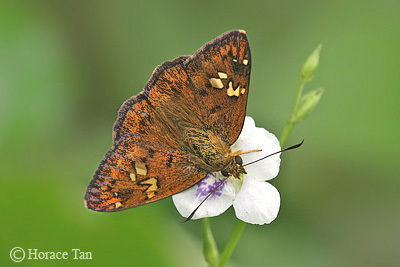 Butterflies taking nectar from the flower of the Chinese Violet. 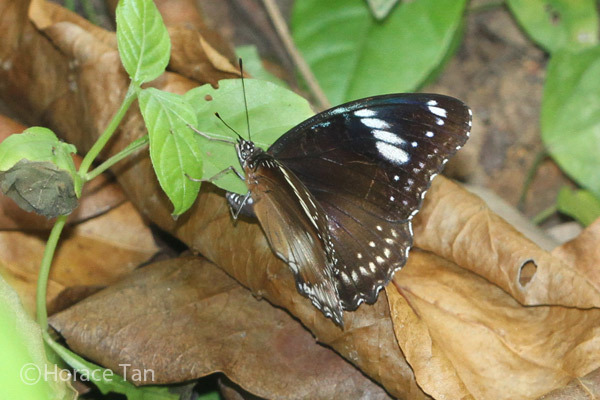 Top left: Fulvous Pied Flat, Top right: Telicota sp. ; Bottom left: Pitcher Blue; Bottom Right: Tree Flitter. 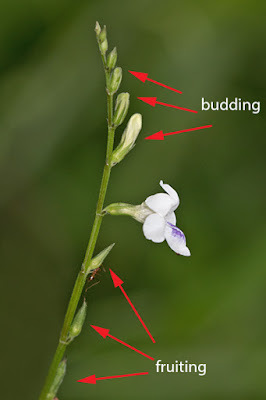 The flower buds on an inflorescence of the Chinese Violet do not blossom simultaneously but progressively from the bottom to the top, and fruits would be forming while the upper flower buds are yet to blossom. An inflorescence of the Chinese Violet showing the progressive development of the flower buds, in the bottom to top order. 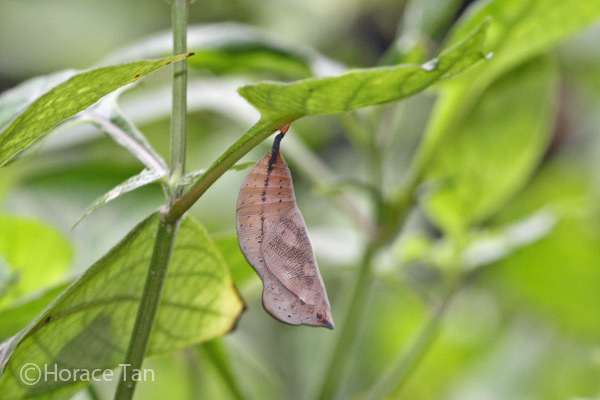 Each fruit is a club-shaped capsule, up to 35mm long, green when developing and pale brown when ripened. Each fruit has 4 seeds which are brown, lens-shaped with irregular margins. The seeds are expelled explosively upon ripening of the fruit. 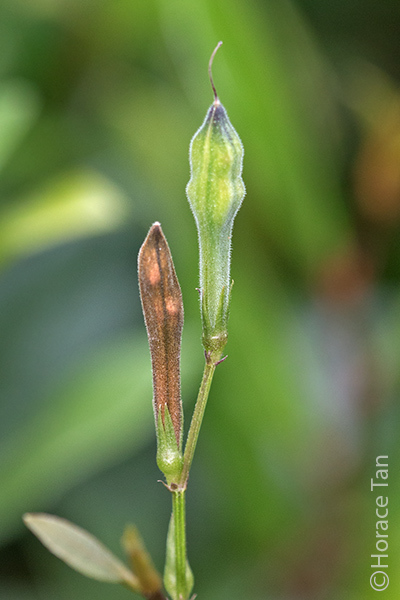 Two young fruits near bottom of an inflorescence of the Chinese Violet. 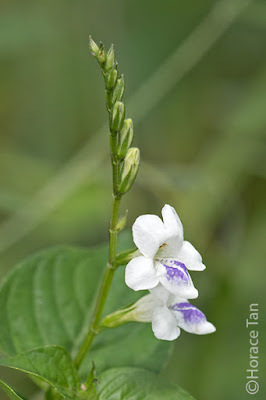 Two fruits, one ripened, at the terminal end of an inflorescence of the Chinese Violet. 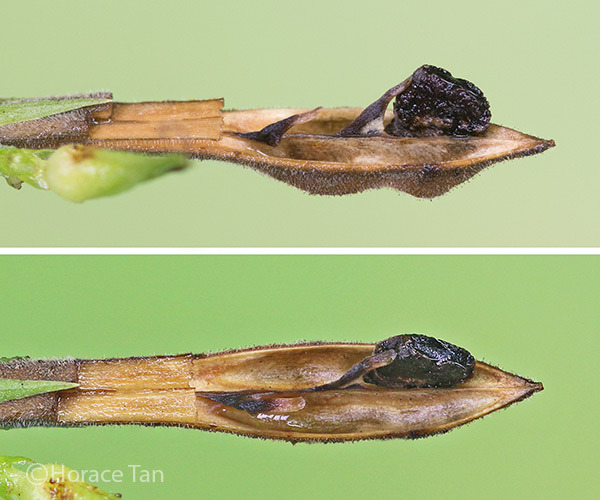 Two views of an opened fruit capsule with one remaining seed shown. In Singapore, the Chinese Violet also serves as the larval host plant for three butterfly species: Jacintha Eggfly, Autumn Leaf and Blue Pansy. 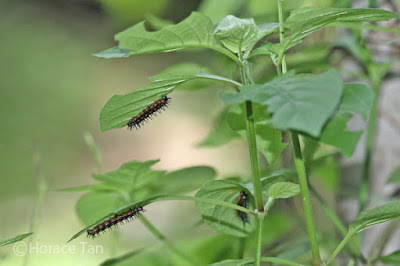 All three belong to the Nymphalidae family and the Nymphalinae sub-family. A Blue Pansy (female) butterfly. 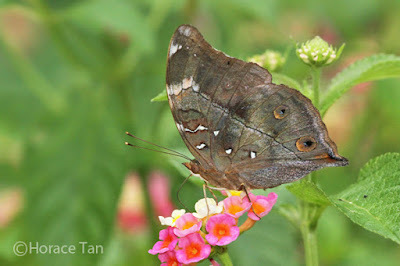 Eggs of these three butterfly species are laid singly or in a small, loose cluster on the underside of a leaf of the Chinese Violet. A female Jacintha Eggfly laying eggs on the underside of a leaf of the Chinese Violet (not far from the Vivocity mall). A female Autumn Leaf butterfly laying eggs on the underside of a leaf of the Chinese Violet. 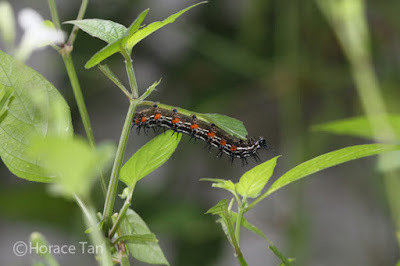 Caterpillars of all three species feed on leaves of the Chinese Violet and typically rest on the underside of a leaf when resting. 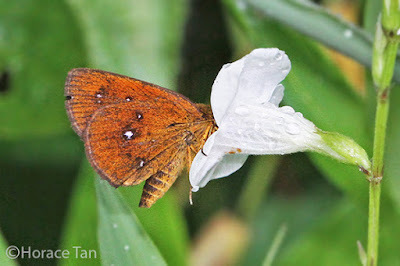 Several caterpillars of the Autumn Leaf butterfly sighted on the Chinese Violet in a wasteland. A final isntar caterpillar of the Autumn Leaf butterfly sighted on a Chinese Violet plant at a forest fringe. A Blue Pansy caterpillar found on the inflorescence of a Chinese Violet plant at a roadside in Jurong. 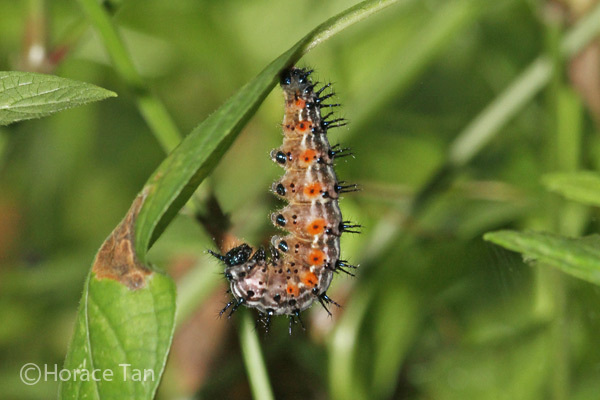 The caterpillars of all three species would wander away from the host plant (seeking a pupation site) when it is time to pupate. However some of them could still opt to pupate on the underside of a leaf or a leaf stalk of the Chinese Violet. 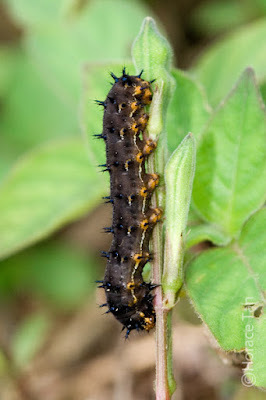 A pre-pupatory larva of the Autumn leaf found on the underside of leaf of the Chinese Violet. 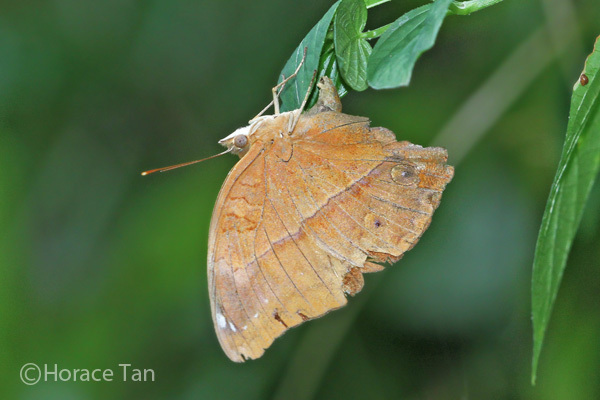 A pupa of the Autumn leaf found on the underside of leaf of the Chinese Violet. Next time when you are out for a walk in our parks and forests, or simply taking a stroll on a pavement in your residential estate, do take a good look at any patch of weeds present, chances are that the Chinese Violet will be there. And you might just be rewarded with a sight of insects visiting its flowers, or caterpillars munching away or resting on its leaves. 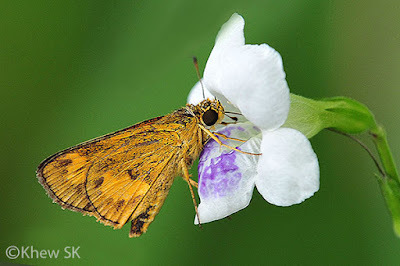 Chiniese Violet Asystasia gangetica subsp. 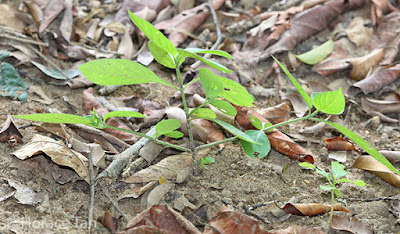 micrantha, Weeds of Australia. Text by Horace Tan, and Photos by Tan Ben Jin, Mark Wong, Khew SK and Horace Tan.